A lot of funny bits with nothing to really string it all together. 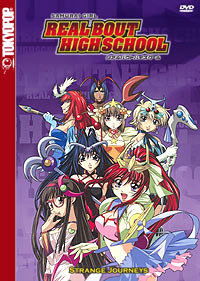 Real Bout High School has quickly gone from an action-packed program to a hilarious spoof of everything from fighting series like Street Fighter to classic settai shows like Power Rangers. Where volume one was more down-to-Earth, so to speak, with its school atmosphere, volume two took things to a new level with Ryoko getting a rather unusual job. Volume three takes things even further into left field. Honestly, I thought this show was going to be nothing but a comedic female version of Street Fighter and I'm pleasantly surprised to learn that it's much more than that. The plot meanders a great deal between episodes. The only real thing that ties everything together is the looming threat of some force in the fantasy world of Solvania, that place Ryoko gets transported to at the worst of times. Things begin, interestingly enough, with a beach episode. Yeah, fan service to the max. The girls and guys hit the road for the sake of training and end up playing volleyball, soaking up some rays, and investigating a haunted island. Yeah, you always gotta have a haunted island when you go to the beach. Love Hina had it and so did Card Captor Sakura, so it's only logical for Real Bout to cram one in. From there the plot does get advanced a little. Episode nine, or rather that episode in the middle of the disc with the annoying little girl, spotlights the return of Magical Girl Oyster Lulu. I enjoyed Oyster Lulu as much as the next person, but did we really need another episode of it? It was a fun romp, but this is just too much. Get back to the main program! Luckily, the show redeems itself as things shift back to Daimon High in the next episode. In this episode we get to see some character development between Ryoko and her love interest, Tatsuya, as they practice for a play together. Truthfully, if it weren't for the weird chanting guys, I'd say this show didn't have a central focus. If it weren't for the big threat looming in Solvania, you could easily right this show off. By adding that big threat and a few other mysteries, it's going to be interesting to see how everything plays out in the end. The extras are rounded out by some funny out takes from the English dub, translator notes, the end of the episode 'Special End Corner' segments, line art gallery, and the second part of the video interview with Ikue Kimura. Also worth noting are the awesome menus that continue to mimic fighting games of yesterday. It's good clean, cavity-forming fun for the whole family.